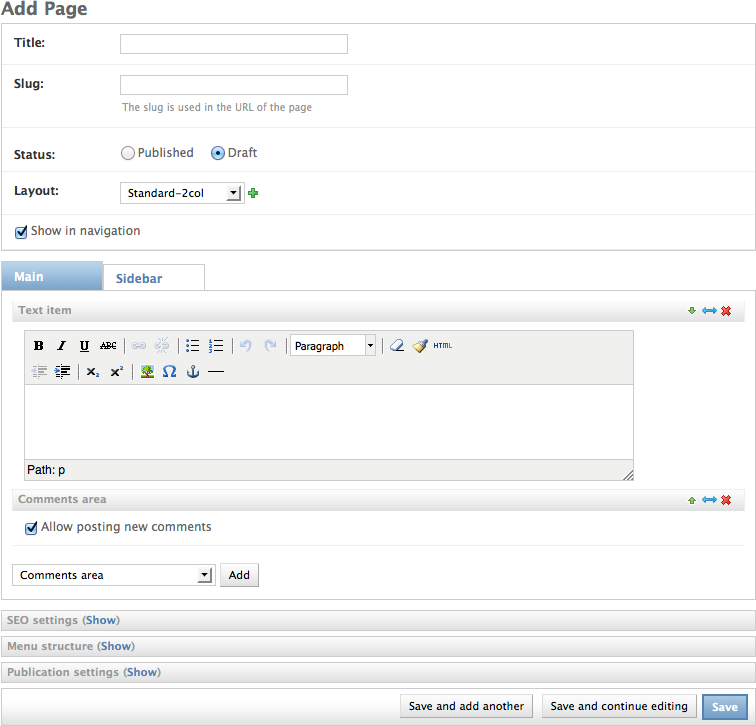 The fluentpage provides a page type where parts of the page can be filled with flexible content blocks. This feature is provided by django-fluent-contents. The combination of django-fluent-pages and django-fluent-contents provides the most flexible page layout. It’s possible to use a mix of standard plugins (e.g. text, code, forms) and customly defined plugins to facilitate complex website designs. See the documentation of django-fluent-contents for more details. This installs the django-fluent-contents package. These placeholders will be detected and displayed in the admin pages. Place the template in the template folder that FLUENT_PAGES_TEMPLATE_DIR points to. By default, that is the first path in TEMPLATE_DIRS. A website with custom design elements can be easily editable by creating custom plugins. Creating new plugins is not complicated at all, and simple plugins can can easily be created within 15 minutes. The documentation of django-fluent-contents explains how to create new plugins in depth. This module also provides the FluentPageBase and FluentPageAdmin classes, which can be used as base classes for custom page types that also use the same layout mechanisms.